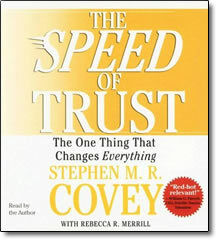 Speed of Trust – by Stephen M. R. Covey – CD or MP3 – Discount! Covey reveals the 13 Behavious common to high-trust leaders throughout the world and demonstrates actionable insights that will enable you to shift your behavior to increase trust in all your relationships. For business leaders and public figures in any arena, The Speed of Trust offers an unprecedented and eminently practical look at exactly how trust functions in our every transaction and relationship—from the most personal to the broadest, most indirect interaction—and how to establish trust immediately so that you and your organization can forego the time-killing, bureaucratic check-and-balance processes so often deployed in lieu of actual trust.